Looking for inspiration? Look at this Onyx Ashanti's gesture project using XBees and the Arduino Fio. Designing a prototype and full size table made out of cardboard. 1) Need a reverse polarity protection diode on the usb power supply. Having a battery and charge system is very nice but the arduino chip would benefit from knowing the health of the battery via an arduino ADC pin. A remote sensor board such as the fio can only be relied upon if it can known, and respond to, its own capabilities. For example if the battery is very low, we would want to slow down xbee transmissions (which use a lot of power). or notify the central node that it isn't getting enough light/charge to support its demands. If the battery falls below a certain value wireless programming will fail. Do we want to allow that in a remote device? If we are very short of power the fio shuts down. It starts again as soon as there is enough power for the avr chip. However, in the case of a solar charge, there might still not be enough power for the xbee. In which case attempting an xbee transmission uses all the battery power and the arduino shuts down again. So, when the arduino starts, we need the xbee to sleep until there is enough power to safely make a transmission. In the perfect world we would really like to be able to alter the frequency of our sensor reading and data transmission to a rate that ensures the battery gets charged. My remote fio sensors network would really benefit from an easy way to know when (or if) they are charging. These are really great recommendations! I'm re-designing the Fio and will try to incorporate some/all of these. I'm anxiously awaiting for it too! They're out of stock, so maybe they're working on the new rev and not making more old revs. I'm also curious about the timeline, even if it's just something slightly more clear than when the iPhone 5 comes out. :) I'm more likely to buy some of these with those features, and I'm willing to wait a month or two before I move forward with the project. Nate, I am pleased you found my comments useful and I am looking forward to the changes. Thanks very much. Looking at buying a bunch of these for solar remote sensing and second Visual Micro's suggestions. What's the status on the re-design? Anytime soon? On point one: the same happened to me. I think I blew the voltage regulator that handles the voltage from the usb port. I can still charge. But I can't run without a battery anymore. Is there a fix? To upload code, check this tutorial created by Arduino. 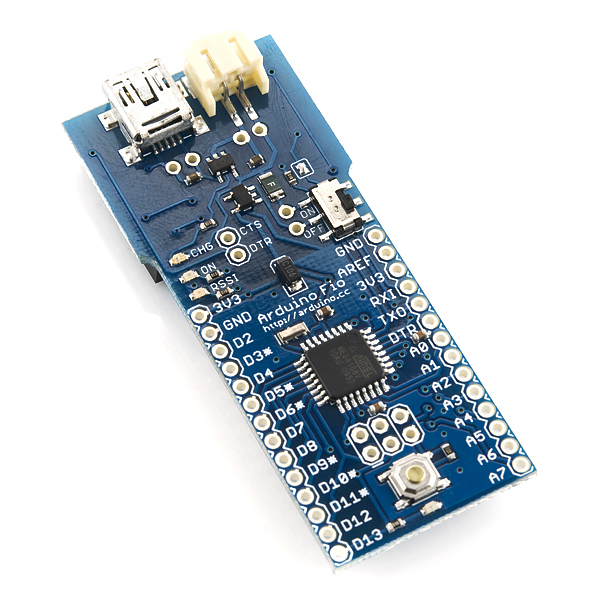 You need a header pin and an FTDI => http://arduino.cc/en/Main/ArduinoBoardFioProgramming. I've understood that lithium ion and lithium polymer batteries must not be completely drained or they will get damaged. Is there a protection circuit in Fio that prevents this from happening? I.e. does it shut itself down when battery voltage drops before the last juice is gone? There are protection circuits in the battery that prevent this from happening. I too have a 50mw xbee to power with one of these. I took off the v/r easily enough, and replaced it with digikey p/n 296-15819-1ND. It works now. Incompatible with Series 2 Pro modules (XBee-PRO ZB S2B). Fio keeps rebooting, sometimes it will eventually boot and be OK other times it seems like it will keep rebooting forever. If I remove the XBee or supply 3.3v directly to the 3.3v pin it will boot with no problems, and operate like expected. Using Lowest Power Level and disabling boost mode. Leaving XBee sleep, it tries to boot first before it goes to sleep. This is interesting. We've been populating the Fio with the higher 500mA output voltage regulator for many months now. You shouldn't have any issues. We'll take a closer look. I have the same issue with a pair of series 1 pro xbee modules... the Fio is constantly rebooting (it executes the code in the setup() function and doesn't go into the loop()) :S I wonder what the solution is ? Have there been any updates in the past 3 years for this product? Can you use/charge this board at the same time? Looking for something I can plug a solar charge into along with the lipo so it can be placed outside away from a regular power source. I've never work with any micro controller before as wiring them but have with other things but after being out of jvs school and now 49 years old. And having a son that's 8 and I'm back to the my childhood days with the new flying helicopters with the stuff that I want to know is all of this stuff have too be downloaded too work before use or does some of them work out of the box cause just want too know where to start please as I don't want start off with all the stuff and not have the avr too prgram and with reading the post on this should I have current sender we love the time we have together and love the stuff I am seeing now its nothing like when I was in too it . But want help please as he wants me to build him something like the the fly pack them younger guys have ! Can the Fio support both an Xbee module and TFT display. Anybody doing this?Thanks. I am using Fio / Xbee (Series 1) + Xbee Explorer setup with 4 capacitive sensors (on 4 digital pins) on the Fio, that is always sensing the environment (no sleeps) - and I am receiving the data in MaxMsp via serial. I am planning to use a 2000mAh or 6Ah lipo battery, and I would need some help with calculating how much mAh the setup actually would need for a 25-30 hrs runtime. Planning on no breaks â the Fio and Xbee will always be on. Is it possible to succeed with a maximum of 6Ah lipo..? Also suggestions on how to configure the Xbee for avoiding performance that I actually don't need it to doâ¦? Hi, I am trying to use Fio with xbee s2 modules. My system is working with arduino nano. But when I switch to Fio I cannot send any data to coordinator. It looks like Fio is is constantly rebooting. Has anyone had similar issues? Thank you. Has anyone an idea how long (approximately) (is it hours, weeks, months, a year, ...) a Lithium Polymer Battery (3.7V - 2000mAh) can last (without recharging) using with an Arduino Fio with an XBee? That depends on what the Fio is doing as well as what XBee and what the XBee is doing. A 2000mAh battery will provide 2000mA for 1h or 1000mA for 2h, or 100mA for 20h... But how much current a Fio and an XBee will use depends on the application. If your Fio is reading a sensor every 5 minutes and sending the data over a regular XBee module which is asleep when not being used, you may only be using a few mA. If the Fio is running all the I/O pins and running 20mA through them and constantly broadcasting data through an XBee Pro, you might be using a few hundred mA. Uhm, on the picture it shows an ATmega168V, but on the description, it claims it is ATmega328V. Which one is the correct? Is it possible to power Fio with a 6V or 12V lead battery? Where should it be plugged? To the BAT + - ? In the description given on the Arduino page there are two statements which look to me a bit contradictory: (1) "Input Voltage 3.35 -12 V" (2) "with a regulated 3.3V supply on the 3V3 pin or a Lithium Polymer battery on the BAT pins. The power pins are as follows: BAT. For supplying a Lithium Polymer battery to the board." Thanks for the help! I also have a design suggestion for the Fio: Add a capacitor (I'm using 220uF, but you may find a lower value is equally good) between pin 1 (+3.3V) and pin 10 (GND) of the Xbee sockets. I've purchased 2 of these and am using them with 2 different Xbees (Xbee S6B Wifi module and Xbee Pro XSC). In both cases, I found I needed to add the capacitor for proper connectivity. For the Xbee S6B, I was unable to connect to the WAP at all without this cap. For the Xbee Pro XSC, I got a connection without the cap, but very poor range. FYI: I just released the "magic blue smoke" from my Fio by supplying it with 11.5V and now it is unresponsive. The Arduino Fio homepage says it can handle 12V, but I'd recommend no more than 10V. I am using the Arduino FIO and am using AVR to put it to sleep and interrupts to wake it up. Since I'm running the FIO on battery power I'd like to minimize power consumption, particularly during sleep. The ON led is constantly on though which needlessly wastes the battery power. Got any tips for how to turn off the ON led? maybe cut the trace? I think it's hardwired to the power supply, so there's not much you could do other than that. I see you have the 5v vcc / 3.3v io ftdi cable (https://www.sparkfun.com/products/9717) listed in the recommended products area. Is this a good idea? I had actually been using this cable on my fio (having forgotten that it is 5v power) and was wondering how the pin 13 led had gotten burnt out. Now I think I know. OK, For some clarification. These can only be programmed wirelessly with Series 1 XBees, correct? These can use Series 2 or higher XBees for communication (just not programming), correct? Thank you. And thank you for reducing my part count. Wireless sketchloading basically requires 2 things. The first is a serial connection which the XBees provide without a problem. The second is a way to reset the module. My thought is that if you can hit the upload button and then hit the reset button a few seconds later you don't really need wireless sketchloading so we do want to make sure we have autoreset. I don't know of a good way to pass an autoreset command from the computer to the Fio using the Series 2 XBees, only the Series 1. So really you can use anything that allows you to pass a digital signal for the autoreset and does serial. The short answer... Correct, you must use Series 1. You can wirelessly program FIO and other arduinos with a proper connection of XBee DIO3 to Arduino reset line (all sparkfun pro arduinos attached to xbee regulated explorer have it) usign XBee Series 2. It works perfectly in a mesh network with lots of device in it, because you can name them wih NI XBee command and address them by name. You just need a special sofware instead of avrdude. I've written arduino programmer that works over xbee network a while ago with a host of other utilities to manage my XBee home automation network (scan, manage, and reprogram remote devices). It has a console interface where you can do things like "discover", "link" console to messages on your network to type text to your devices and "@name avr f:w:your-hex-file". It is avaible on github at https://github.com/elizarov/xtools but unfortunately I did not find time yet to write a decent documentation (there is built in help for console commands, though), while I'm the only one who uses it. You'll need to have your device attached to XBee with AT firmware running at the same baud rate as your arduino bootloader, while for the programming computer I use XBee usb dongle (thank you sparkfun) and an XBee with API firmware (any fast enough baud will work - it does not have to match and I have a mix of 57600 and 115200 bootloaders in my home). If anybody is interested, I can spend some time writing a better documentation. Did you ever end up writing more about this? I'm interested in using XBee series 2 modules for a home mesh, and I want to be able to reprogram them remotely - seems like what you've done would be a great starting point. Hiya all. OK, so I've got some questions about the Fio (might be pretty stupid actually) 1. Is it programmed in the regular Arduino IDE? 2. What is the biggest servo it can power on a 3.7v Li-Poly? I'm having trouble using Fio with an Xbee 900 Pro. I'm using a 5v 1a power source, the CHG led is on (but I have no battery connected) the ON led is also on when the xbee module is connected. Where it gets weird .. if I'm using an ftdi cable, the ON led is on, and it starts correctly. FIO/battery/XBee solution looks perfect for my project where I am collecting sensor samples from multiple points on a mesh network. However, I see that Series 1 XBee don't support mesh networks except via the DigiMesh firmware. Does anyone know if the DigiMesh firmware still allows the FIO to be programed wirelessly? Alternately, can XBee Series 2 be used to program the FIO (as parallax suggests on this page despite other sources saying it's not possible)? Thanks much! It is possible to repogram via mesh network. I do it for over 2 years now. You'll need a special software. See my answer above. I read a lot but I'm confused about charging Polymer Lithium Or Battery directly via the FIO. Yes its possible to charge directly via the FIO. At least for the batteries that SparkFun carries. The "CHG" LED will illuminate while its charging and turn off when its done. One thing to note is that the "ON" LED will only light up when you have a XBee connected and turn on the FIO. ie, it will not light up if you just turn on the FIO by itself. question on the power supply capabilities of this board. Will the board provide enough current to power the "basic 16x2" LCD at 3.3v? Or should I get the 5v version and power it directly from the charger outputs. But then the next question is there going to be a problem between the 3volt logic pins on the processor and the 5v logic on the display if I do that? Thank you! You'll be fine with the 3.3V version of the display. The Fio's power supply is more than adequate, and as you mention there are no voltage issues when interfacing the thing. Have fun! I am wondering why the Fio was designed with the XBee Socket in the direction the way it currently is. I would have thought having the antenna at the edge of the board will be less likely to get interference and with some Chip antenna XBee socket packages (zigbee, bluetooth, or wifi) their datasheets do state to keep the area under the antenna free of parts or copper (ie. a keep out zone). Was it considered to have the battery and USB connector at the other end of the FIO and turning around the XBee Socket? Or was there a specific reason for the current layout? I have a question about programming this board. I don't want to do it wirelessly but I do have a FTDI Basic Breakout - 3.3V board. Looking at the scheme it appears that I would connect the FTDI directly to the following 6 inputs. GRN/AREF/VCC/RXI/TXO/DTR. Can anyone tell me if that is correct? On the fio, does power via USB only work to charge the battery, or is it possible just to run it straight from USB power? You can run it straight from USB power. Does this have circuitry such as the Li-Po fuel gauge? these go quickly! we are building more currently. 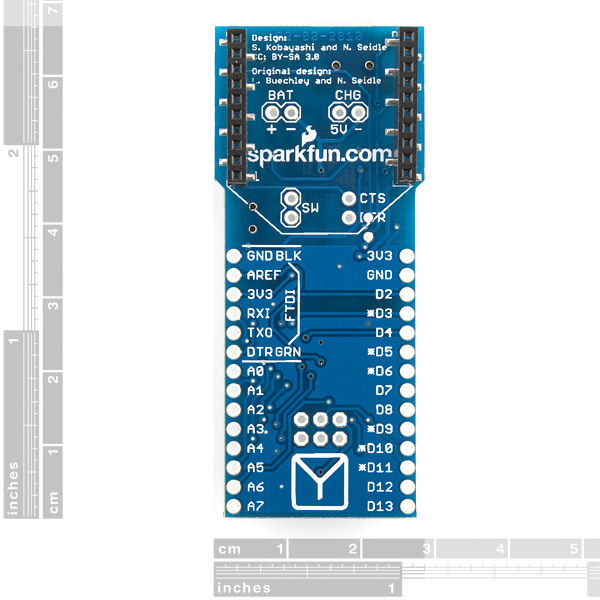 Anyway, I wanted to suggest that for boards like this, which have a USB connector but only use it for power, it'd be nice if the USB data lines were made (more) accessible in case I want to add USB circuitry. I love my FIO, but I'm constantly wishing there was a version that could supply the 5V that a lot of sensors demand. can you put the 328p chip on this board into the lowest power sleep mode (sleep mode power down) with a watchdog timer wake (once every 8 seconds), disable the ADC and the analog comparator and tell me what the power useage looks like? I also plan to use an Xbee. The 1mw one. But I have an idea of what to expect from that in sleep mode. I have always hated the voltage regulators on these systems - they take more power than the 328p chip in sleep mode more often than not - and I want to know what the power useage looks like in sleep mode. Was debating between one of these or making my own board - without a voltage regulator. Power in sleep mode directly relates to the battery life. I want about 1 year on a 2000ma battery. But waking only once every 8 seconds, sending a few bit of data over 20ms (well, 20ms to wake up, send data, go to sleep) plus looking at about 70 milliamps wake power, that means I need 50 microamps of sleep power to meet the 1 year goal. the 328p datasheet says "Power-down Mode: 0.1 Î¼A" but thats with like everything turned off, so I know that is unrealistic. the xbee is going to eat 10 - 20 microamps of that up. I hope for a reply of "less than 30 microamps"
You mentioned 1 year battery life on a 2000ma battery. Did you succeed it? I have one lipo 1000mAh battery, and I want to just achieve 24 hour life time by setting Fio + Xbee in a cycle that Xbee sleeps for 10 minutes, then wakes up and send data with 10Hz for 1 minute and then again sleeps. The numbers are not strict but I think that I should not put Fio into sleep because I have a sensor(photocell) which always listens the environment to detect an event. All in all, I have a Fio, a Xbee(not pro), and a sensor combination. How many hours of battery life can I achieve by just putting Xbee to sleep, not Fio? I have 20 hours battery life, am I doing something wrong? 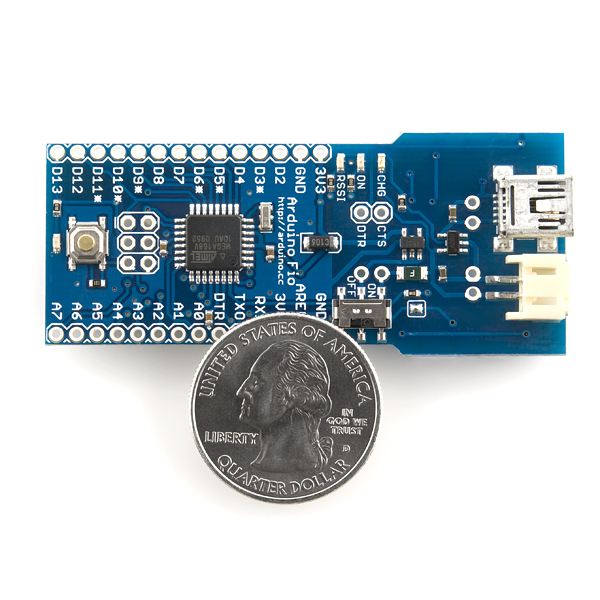 Okay I just bought one of these recently and I'm new to the microcontroller/Arduino world (I know that an Arduino is a type of microcontroller)so I need a little help here. Here are some questions I have: 1. What type of serial connector or XBee do I need to program this? 2. What type of battery can be used with this? 3. Are the different types of shields for other Arduion products compatible with this? Thanks in advance! Note that the battery terminal jack is REVERSED compared to most battery packs, so you'll have to make a crossover cable. I realize that there isn't really a standard but every single battery I've seen has been backwards. And if you do hook it up wrong, it seems to blow up the 5 pin chip closest to the jacks.. This is the li-po charger chip.. The usb power seems to pass through this, so you'll have to use battery only until fixed, and of course it will no longer charge the battery. We use the same 2-pin JST on all our products and they're wired to work with our standard LiPo batteries. I agree there is no standard so if you're hooking up something else, do pay close attention to the +/- silk screen indicators on the board. What is the vertical dimension of the board with an XBee module on it? Without? I'm having some problems with power consumption during sleep modes. FIO + XBee = 0.75 mA! The only changes I've made to the schematic is the addition of jumpers from FIO D2 and D3 to XBee DTR and CTS for sleep and ready status. Does anyone know how I can get the current down to the ~0.300mA I think I should be getting? It looks like MCP73831T is U1 on the schema. Does anyone know what component is U2 on the schematics? I blew something on the board by applying voltage around 8V to charging terminal. The board still functions well when powered from UART cable but the charging and powering from USB cable is not working. I wonder if I blew U1 or U2. Anyone? U2 is the 3.3V voltage regulator. Try applying your 8V at the "BAT" terminals. If it works then it's U1 that you blew. I had the same thing happen to me when trying to use 9V batteries. Would I burn the voltage regulator on Arduino FIO if I connect it to 12V? 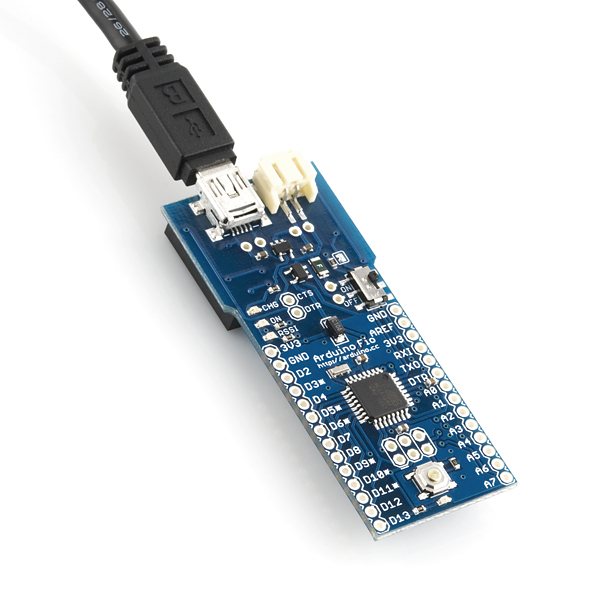 could it be possible to use this board with XBee Pro 60mW and a jpeg rs232 camera like http://www.saelig.com/product/BOVI008.htm, and transmit wirelessly a jpeg from time to time? can i use sleep function on these board to save battery? I need only one picture a day... thanks for your support. Excellent device, just beware of the specs from Arduino Fio Homepage because it does not handle 12v at all, keep it under 5v or it will get very hot, at 12v it burns and smell ;-) the best option is to use the 3.7v batteries and charge it via usb. I was checking my Fio fuse settings with a pod (avr dragon in isp mode) and found that the efuse was set to an invalid value. The brownout bits were 000. That is listed as "reserved" in the datasheet, wonder what it does? I think they are supposed to be 101, or "5". What made me go looking is I found the same thing in an openLog board (same cpu) so I got curious. The FIO has an SMD version of the ATmega328 chip. It has 32 pins and the Uno has 28 pins. Can anyone help me with the Pin Mapping of FIO? I am able to wirelessly program it as Nate showed in the tutorial by soldering a jumper in the USB Explorer. Just cant find a way to understand pin numbers for writing the sketch. Whats with the Analog pins? What exactly is your problem? The analog pins are labeled on the board A0-A7. You can read the value with analogRead(pin) in your sketch, like analogRead(0) for A0. Does this help? Does it works with Xbee Series 2 Modem? also, Is it avaiable to built wireless programming env. with XBee Series 2 modem + Fio + XBee Explorer Dongle? Does it woks with Xbee pro? I can confirm that the Xbee Pro works with the FIO. I Like the Fio so far. Did have a problem with wireless programing. I gave up and was able to successfully program via a FTDI board. With that success I went back to the wireless programing and solved that. My experience is that the XBee S1 boards must use enough power that the USB only power is not enough. With a battery in circuit even under charge I had no problems with wireless programing. This problem may only be unique on my computer's USB power distribution. I used the setup utility to set the XBee parameters. Just a recommendation,if you are sure everything is setup correctly you may have the same problem. Add a external power source battery or regulated power supply. 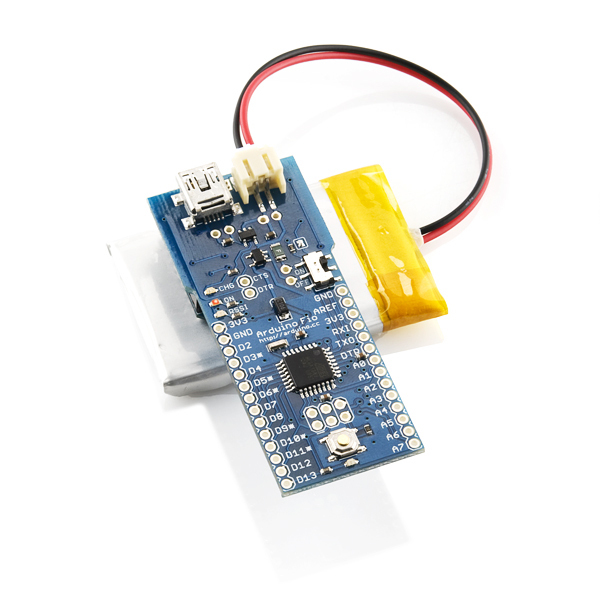 Anyone try or know if the seeedstudio bluetooth bee works with this module? Would that be worth the effort to use BT with this guy or just use regular 802.15.4 Xbee? I have successfully gotten the BTBee "working," which is to say, I can use it to talk serial over Bluetooth. However, to program the FIO, I have to remove the Bluetooth module and program using hardwired serial/FTDI. There must be something about the hardware that causes the programming to fail when it's plugged in. I'd love if I could program wirelessly, so let me know if you get that working. Hi, I'm using the RN42-XV Bluetooth module to wireless program an Fio board but I can't have the DTR or RTS signals working to drive the Reset pin. I pulled low BT pins UART_CTS, DCD (PIO3), DSR (PIO6) and CTS (PIO7). The only profile that seems to drive remote DTR & RTS is MDM SPP (the Roving networks datasheet states that profiles DUN should also drive them but I can't see that). But with the MDM SPP profile, the device is automatically recognized as a keyboard which prevents use of the terminal or the Arduino IDE. Does anybody have a clue ? I see other Arduinos and the Funnel logos in the eagle library but not the Arduino Fio. Any plans to add it? Unless I screwed up counting, this board's footprint is 14 pins long and 10 pins wide. Correct? Would I burn the voltage regulator on Arduino FIO if I connect 12V to it? Just received the new FIO. and when I power it up....The charging led goes on but not the power led. Anyone else have this? My older one( the last version) works as it should...Also this fio is blinking, so the code works, but the leds are not right..??? If you're still stuck, the USB is for charging only, and the battery is required at all times for power. Arduino boards are programmed by a serial connection. 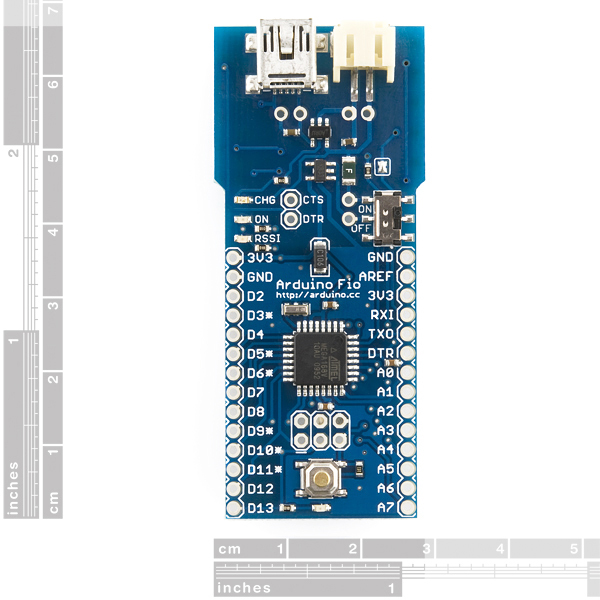 The larger boards (Uno and Mega) have an FTDI chip built into them that converts from USB to serial (so you can just plug a USB cable into them). Our smaller boards (Pro, Pro Mini, and Fio) don't have this FTDI chip built into them; we've moved the chip into the FTDI cable / Basic Breakout boards to save cost and space. So no, you can't just strip a normal USB cable, you'd still need something with the FTDI chip to program this board. And you could use a coin cell to power these, but unless you're making heavy use of the sleep function, the battery won't last very long. these don't happen to come pre-loaded with a wireless bootloader...do they? It is easier than you think to get the wireless running. There isn't such a thing as a wireless bootloader. It's the wiring of the fio hardware that allows the wireless to happen. You only have to configure your xbees to allow wireless programming. With the xbees configured, the arduino programming tool will not know that it is working through xbees so it will work as normal. Same goes for the arduino avr chip. Yes, it was very easy, thought the instructions need an update. i had to cross reference the Adafruit writeup. I don't think the original fio did, and I would imagine they'd be saying it if so. So I have no answer to your question. In case anyone is wondering what the new revision changes, here's a quote from the product page of the old Fio: "The new revision swaps the MAX1555 charging IC for the MCP73831T LiPo Charger". It looks like MCP73831T is U1 on the schema. Do you know what component is U2 on the schematics? I blew something on the board by applying voltage around 8V to charging terminal. I wonder if I blew U1 or U2. U2 is a 3.3V regulator. You can find a replacement here. The XBEE 900 PRO is compatible with this board ? the bypass diode problem have been fix for this board model ? I am using a 900 PRO XSC on the Fio with no problems.